Being a full time mom sure has a lot of perks. I love the fact that I can be hands on with my kids and develop much deeper bonding with them. Aside from this, staying at home all day long allowed me to rediscover my passion for blogging. I love sharing my thoughts, my experience and most of all meeting new people from different walks of life and making new friends! I've also been hooked in to joining online contests, and had my share of winnings. All of these things are what's keeping me busy and entertained nowadays. I really feel blessed with what's going on with my life right now plus September is my 2 kids birth month, literally it's something to celebrate right? And because of that...I decided to share my blessings in a form of a giveaway. 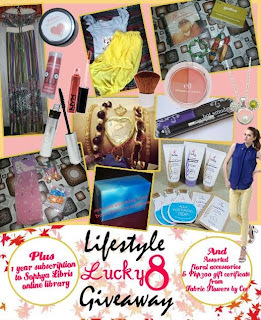 Yes you read it right, this post isn't titled "Lifestyle Lucky 8 Giveaway" for no reason. I know a lot of you loves online contests like I do! Okay so I'm gonna cut this short, I know you are all excited to get to the giveaway part because I am as excited as you are! Yes yes I am, because it's my first ever giveaway! 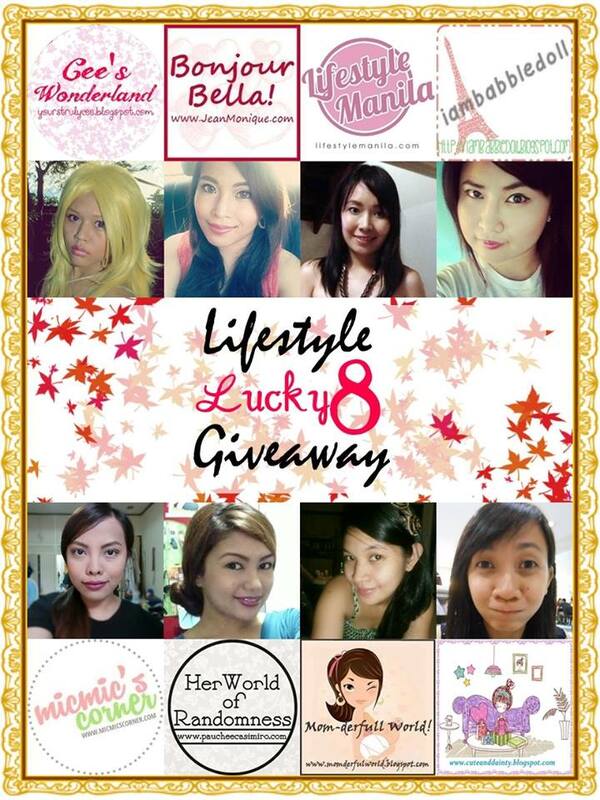 Wanna know why it's called "Lifestyle Lucky 8 Giveaway?" 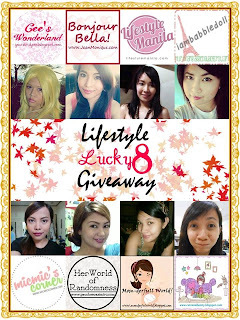 EIGHT (8) BLOGGERS are doing this Giveaway Collaboration for you, our lovely readers! See what I told you about gaining friends? For a newbie blogger like me, it's really an honor that I'm able to collaborate with all these 7 equally witty and known bloggers. These are the fab prizes you could get! And you know what's even more fabulous? 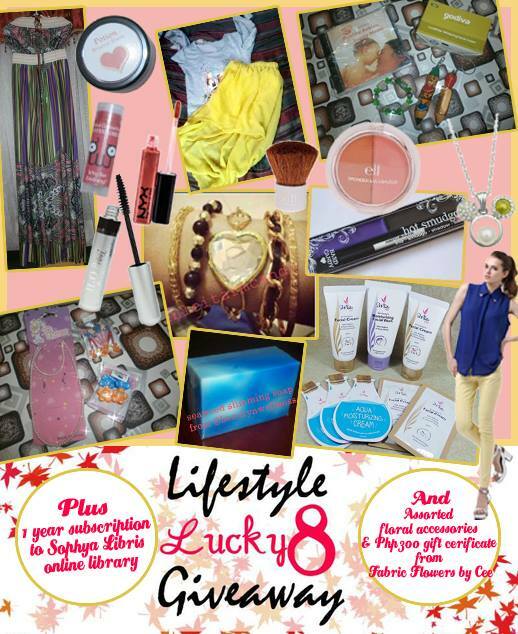 One lucky winner gets to take home all these prizes worth at least PhP 4,000!!! This giveaway starts September 14, 2013 exactly 12 MN and will end on October 14, 2013 at 11:59 PM (GMT+8) and is open to Philippine Residents only. If you are based abroad, you can still join as long as you have a Philippine address where we can mail the prizes. The winner will shoulder the shipping fee of the items. The winners will be chosen randomly via Rafflecopter. It'll be announced on our blogs and/or our social media accounts. The winner should e-mail Pauchee Casimiro through her CONTACT FORM within 48 hours. Failure to do so will forfeit your entry. Another winner will be chosen and will also be given 48 hours. ***If a task on the Rafflecopter gadget is NOT APPLICABLE to you, PLEASE SKIP IT. If you would type anything such as "none", "n/a", etc. and submit it, the points allotted for that task would still be credited to you even though you did not do the task asked. This is one form of CHEATING, may it be intentional or not. So DO NOT TYPE ANYTHING ON THE VERIFICATION BOX AND SUBMIT IT if you do not have the account for the task or you did not/choose not to do it. We do these giveaways for our faithful readers and it would be unfair to those who really exerted the effort to do every single task to gain their rightful points. Thank you and Good luck!